In the Xsheet view, you can fill columns using two different filling modes: Overwrite or Insert. These modes control the filling behaviour. The Timeline view only uses the Overwrite mode. By default, the Xsheet view is set to Overwrite mode. 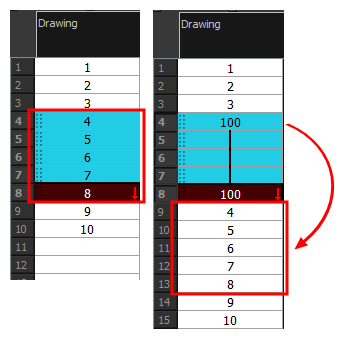 Adding a new value or a new value sequence overwrites existing ones. The existing timing sequence remains in the same place and is not pushed down the column. The Insert mode is the opposite of the Overwrite mode. 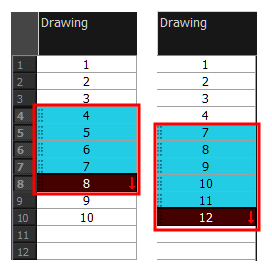 When you add a new value or a new value sequence over existing ones, the new values are inserted between the old ones. The existing timing sequence is pushed down the column. ‣ In the bottom-right corner of the Xsheet view, click Overwrite/Insert.